Abuja — The deadly Lassa Fever outbreak may continue to threaten the lives of Nigerians and health workers for a long time to come, findings have revealed. 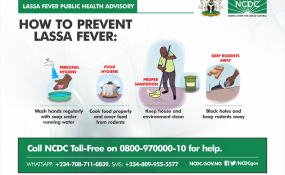 According to the health authorities and experts, Lassa fever is difficult to curtail because it is endemic to the Nigerian environment. In the first quarter of 2018 alone, the disease has caused over 100 deaths with about 2000 suspected cases reported from 20 states. Speaking to THISDAY on the issue, the Chief Executive Officer (CEO) of Nigeria Centre for Disease Control (NCDC), Dr. Chikwe Ihekweazu, acknowledged that while the disease reached its highest peak in the first quarter of this year, the authorities have been able to reduce the prevalence as at April 08, 2018. "We have had the largest outbreak of Lassa Fever in Nigeria's history in the first quater of this year," Chikwe acknowledged. He said: "Unlike Ebola, there is no magic bullet for Lassa fever," adding "It is endemic in our environment and as long as there is rat, we will always have cases of Lassa." Chikwe clarified the difference between Ebola and Lassa fever, noting that once the Ebola chain of infection is broken, you can effectively stop the spread but Lassa has multiple channels or chain of infections. To this end, the NCDC boss declared that "Lassa has come to stay for now" but promised that the vaccine is being developed. He further assured that the fever though endemic and difficult to stop, "is not a death sentence, unlike Ebola," adding that there is effective treament for lassa and chances of survival very high, especially if detected early. He listed the three key areas NCDC has been researching on in order to understand the reason for the increased outbreak and widespread of the disease across the country including: changes in the nature of the virus, environmental interactions between the rats and human population, as well as improved surveillance mechanism. But he maintained that the disease has largely been contained from its peaks in last week February to first week of March with only eight new reported confirmed cases on April 2 to 8, 2018. Report obtained by THISDAY from NCDC indicated that the eight new confirmed cases were recorded from five States - Edo (three), Ondo (two), Ebonyi (one), Plateau (one), and Taraba (one) with three new deaths in confirmed cases from Ondo (one), Ebonyi (one) Taraba (one) and a backlog of an old death in a confirmed case from Kogi State. According to the report, as at the April 2018, a total of 1,781 suspected cases have been reported from 20 states. Of these, 408 were confirmed positive, nine are probable, 1,351 are negative (not a case) and 13 are awaiting laboratory results (pending). The report noted that since the onset of the 2018 outbreak, there have been 101 deaths in confirmed cases, nine in probable cases with case fatality ratio in confirmed cases at 24.8 per cent. Rest of the report noted that "20 states have recorded at least one confirmed case across 57 Local Government Areas (Edo, Ondo, Bauchi, Nasarawa, Ebonyi, Anambra, Benue, Kogi, Imo, Plateau, Lagos, Taraba, Delta, Osun, Rivers, FCT, Gombe, Ekiti, Kaduna and Abia). Nine states have exited the active phase of the outbreak while 11 States remain active. "In the reporting week 14, one new healthcare worker was affected in Ebonyi state with one death. 27 health care workers have been affected since the onset of the outbreak in seven states -Ebonyi (16), Nasarawa (1), Kogi (two), Benue (one), Ondo (three), Edo (three) and Abia (one) with six deaths in Ebonyi (four), Kogi (one) and Abia (one)." It further revealed that "81 per cent of all confirmed cases are from Edo (42 per cent) Ondo (23 per cent) and Ebonyi (16 per cent) states. 15 cases are currently being managed in treatment centres across six states -Edo (four), Ebonyi (five), Ondo (four), Plateau (one), and Osun (one). A total of 4480 contacts have been identified from 20 states. Of these 658 (14.8 per cent) are currently being followed up, 3815 (85 per cent) have completed 21 days follow up while 7(0.2per cent) were lost follow up. "74 symptomatic contacts have been identified, of which 28 (38per cent) have tested positive from five states (Edo-13, Ondo-eight, Ebonyi-three, Kogi -three and Bauchi-one) National RRT team (NCDC staff and NFELTP residents) batch D continues response in Abia State support. National Lassa fever multi-partner multi-agency Emergency Operations Centre (EOC) continues." Also speaking on the issue, Chairman, Medical Advisory committee and Consultant Family Physician University of Abuja Teaching Hospital, Dr. Nicholas Baamlong, blamed lack of government funding of facilities and enforcement of environmental laws for the increased outbreak. Baamlong who lamented the high infection rate of the health practitioners, noted that the necessary health equipment such as hand gloves as well as treatment centres are either lacking or few. Against this backdrop, he harped on the need for enforcement of laws on waste disposal, environmental sanitation, food storage, processing and enabling environment for health personnel. He also called for increased budgetary allocation to health in the areas of training, research and service delivery. The health expert demanded for provision of more centers of excellence for the treatment and diagnosis of Lassa Fever. According to him, every geopolitical zone of the country should have at least one. Speaking further, Baamlong called for increased sensitisation activities especially to the grassroots on the different aspects of the disease. On the hospital/health personnel, Baamlong spoke on the "need for all hospitals to have isolation wards to manage suspected or confirmed cases; Health workers to always ensure they adhere to the principle of universal precautions while attending to patients like use of hand gloves, masks, goggles etc. "Provision of consumables as listed above by various hospital management; prompt referral of suspected cases to increase survival rates." He stressed on the need to also collaborate with international organisations in the area of research for vaccine production and drug development.